Last updated: July 18, 2018 at 5:38pm by Savanah – A recent report mentioned Indian casinos in Arizona did $1.871 billion in revenue for the 2017 fiscal year which is the first decrease in six years. Arizona’s newest Indian casino, the Desert Diamond West Valley Resort Casino, opened in late 2015. It features 1,080 slot machines, the maximum amount allowed, as well as table games. Many people believe Arizona’s laws are fairly lenient when it comes to gambling, I believe otherwise, but you can read this article and decide for yourself. First, let’s look at their definition of “gambling”. Unlike most gambling definitions from other state’s statutes, Arizona’s clearly states, “a game of contest of chance or skill”. The key words are “chance or skill”. Many states only include the word “chance” which leads it open when it comes to poker since most people think of poker as a game of skill and not chance. Having the word “skill” included in their definition doesn’t help those people who play poker since some other states have deemed poker as skill and not chance which has allowed those court cases to be dismissed. For those who remember, Senator Jon Kyl of Arizona was the driving force of expediting the Unlawful Internet Gambling Enforcement Act (UIGEA) passage through the Senate. The UIGEA was passed to help regulate online gambling, although there are many loopholes in the law. In recent years, Arizona seems to have softened a bit when it comes to gambling, online and offline, and could be a near future viable state to pass and regulate interstate online poker. There have been no cases to date within the state of someone being arrested and convicted for playing poker over the internet. 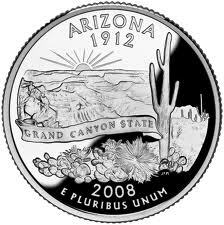 State Lottery – The Arizona Lottery was approved by the public in November 1980, becoming the first state west of the Mississippi to legally have a state run lottery which is overseen by the Arizona State Lottery Commission. Initially, it was passed by a small margin, but more currently it is much more accepted by the general public. In November 2002, 22 years after its inception, 73 percent of Arizonans voted to extend the state lottery for an additional 10 years. Two years before it was to be voted on again by the public for another extension, legislation was passed in 2010 to continue the lottery until 2035. Over $3 billion has been generated for the state since 1981. Lottery players must be at least 21 years of age; the minimum age was 18 until June 1, 2003. Pari-Mutuel Wagering – The Department of Racing regulates the Arizona pari-mutuel horse and greyhound racing industry. They oversee and supervise all commercial horse, greyhound, and county fair races. The Department of Racing also licenses participants, collects state revenues generated by race meetings, and enforces laws and rules related to racing and betting to protect industry participants and the public. Indian Casinos – Brick and mortar Indian casinos are always a popular place to go and gamble. Currently, the state of Arizona has 23 Class III casinos operated by 16 different tribes. Six additional Indian tribes do not have casinos but have slot machine rights they lease to other Indian casinos. Click here to see Arizona’s Indian Casino compacts and statutes. Charitable Gaming – Charitable organizations use legal charitable gambling games as a vehicle for fundraising such as Monte Carlo Nights or Texas Holdem Poker Tournaments. There are strict rules to follow under the charitable gaming laws. In regards to a poker tournament for example, a non-profit organization cannot require a specified donation in order to participate. As in, those who do not choose to donate must have an equal chance to play and win. Another example is the poker game cannot offer re-buys to increase the chances of a player winning. Also, a donor cannot receive additional chips even if he/she donated more money than the other participants. Basically, the playing field must be level.